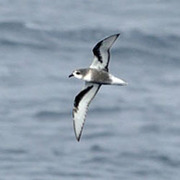 Probably regular far offshore in winter, though seldom seen by birders. Four on Westport (Grays Harbor County) pelagic trip in February 1997; numerous individuals brought within sight of Ocean Shores (Grays Harbor County) jetty during storm in late November 2000. Several records of birds found dead on Pacific beaches, February to July.